Auditions for the 2013 production of Henrik Ibsen's "A Doll's House" will be held on Friday, November 30th and Saturday, December 1st at 7 PM at the Playhouse. The auditions will consist of cold readings from the script. First rehearsal (cast orientation and first read) will be on Sunday, December 2nd. "A Doll's House" will be directed by Nathan R. Miles. "A Doll's House" is our entry into the 2013 AACTFest competition. You can find out more about AACTFest by clicking here. AACTFest competition takes places in three stages; state, regional, and national. Theatre companies compete on the state level, and winning companies advance to the regional level, with regional winners advancing to the national level. The same cast must perform at all levels (if the company advances). AACTFest is a very challenging competition, but is also a very rewarding experience. Come audition so we can show the New Mexico theatre community (and hopefully the national theatre community) what theatre in Hobbs is all about! Just a quick note to remind everyone that the tickets for "The One and Only Santa/ A Christmas Carol" are now on sale. 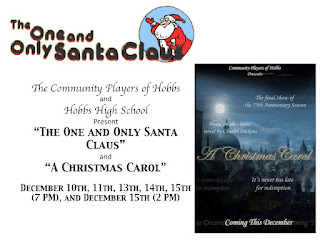 Visit our web site, www.communityplayersofhobbs.com, click the ticket icon on the left. Please come support our local high school students and the playhouse players as well. Also, the deadline for scholarship applications is drawing near. Be sure to get yours in if you are interested. Tickets now on sale for the Christmas double feature! Tickets are now on sale for the Christmas shows! Don't miss this great double feature, along with music by the award winning group "Accidental Harmony"! What is Fleming waiting for? A ballgame? A movie? Who knows...but you can find out just what "Line" is all about on Thursday, November 15th at 8 PM. "Line" is a hilarious and absurd comedy written by Israel Horovitz, directed by Jonathan Bertschinger. Starring Tim Deines ("Fleming"), Nathan Miles ("Stephen"), Karen Widman ("Molly"), Robert Schumacher ("Dolan"), and David Baeza ("Arnall"), "Line" is the story of five people waiting in line, and the lengths they will go to in order to be first in line. Scheming, backstabbing, manipulating...and plain old shoving and fighting! "Line" is free...yes, free! This is to thank our patrons for a great 75th Anniversary Season! Haunted House cast/crew...set strike starts at 9 AM today (Saturday, 11/3/12), going until mid-afternoon. There's a LOT to put away, and quickly (the season is tight...next show needs the stage). Please come help out if you can! "Christmas Carol" cast...a reminder that tomorrow night's rehearsal is for ALL cast members (from Nathan).